Greaser, Tindal and Senior Deckhand. 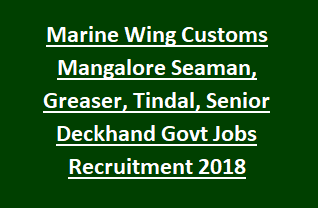 Interested candidates can apply in a prescribed format for this Marine Wing Customs Mangalore Seaman, Greaser and other jobs. Last date for submission application form to Customs Mangalore office is 25-01-2018. Candidates selection will be held through written exam and Swimming test for this Customs Mangalore vacancies of Seaman, Greaser, Tindal jobs. More details regarding this Customs Mangalore recruitment of Seaman, Tindal, Senior Deckhand and Greaser jobs are given below. There are total 23 vacancies in this Customs Mangalore recruitment. Candidates selection will be held through written exam and swimming test. Swimming test consist Jumping from the board and 100 meters swimming. Candidates who are having the necessary experience they can apply in a prescribed format to Customs Mangalore Marine wing within 60 days from the notification given date in employment news. Application from along with necessary documents to be submitted through speed post or RPAD only and also attach the two self addressed covers of 25*12 cms. On cover letter mention "Application for the posts of ------------ and category-----------" at the left side.